Digital Marketing Philippines is a client focused and one of the leading digital agencies based out of Philippines offering the most effective Omni-channel Marketing services to Clients and Business Partners worldwide since 2013. 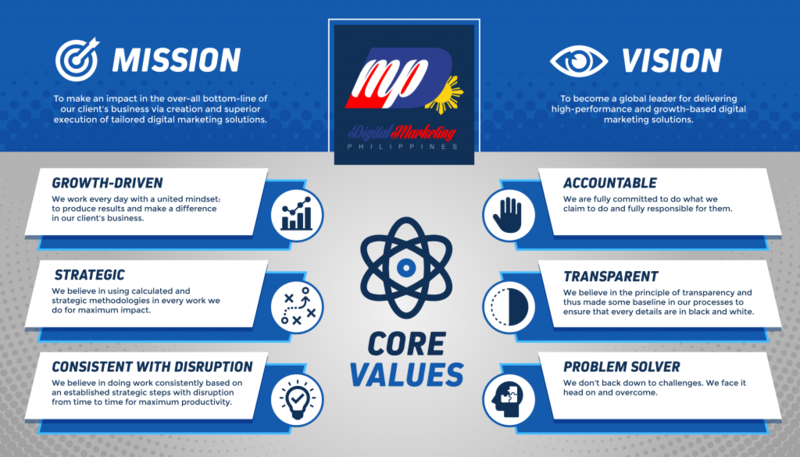 Formally established in 2013 by founder and CEO Jomer Gregorio, DMP started with a humble beginning – with less than 5 employees servicing a handful of small businesses from the U.S. Since then, DMP has delivered high-impact digital marketing solutions to clients from Europe, the Middle East, North America, Australia, New Zealand, Philippines, Singapore, and Malaysia, and now boasts a staff of about 25+ – all equipped with the skills and expertise needed to execute the most effective digital marketing strategies out there today. Jomer Gregorio is an experienced and client-recommended Digital Marketing Consultant with nearly a decade’s expertise in SEO, PPC (pay per click), local search, Social Advertising, and Content Development. Having been sharing his personal thoughts about different industry topics on numerous authoritative websites, Mr. Gregorio has also been invited to numerous Philippine universities for his in-depth and hands-on knowledge in digital marketing, including but not limited to DLSU Manila, De La Salle College of Saint Benilde, Centro Escolar University, Polytechnic University of the Philippines-Taguig, among others. This high level of expertise in digital marketing allows us to fulfill our clients’ goals and objectives in growing their businesses. We leverage the most efficient and cost-effective strategies and tactics in all aspects of digital marketing, enabling us to help our clients bring more customers into their business brick and mortar locations and/or websites. The team at DMP comes with proven success and experience in providing top-of-the-line digital marketing products and services for both local and international clients making us as the ideal provider of Digital services for yourselves. We leverage the most effective digital marketing strategies and Best Practice techniques enabling your brand and businesses to reach the optimum. Digital Marketing Philippines’ trending articles and infographics have been recognized, referred to, and syndicated by other businesses, marketers and universities in the B2B and B2C marketing arenas. Contact us here to maximize your Marketing ROI. The DMP team is comprised of about 25+ dedicated, and creative individuals all coming from a variety of backgrounds and skillsets. Each team member provides unique input into the development of each of campaigns we handle, with the goal of exceeding the expectations and providing the best solutions possible for all our clients. Our combined expertise in Search Engine Optimization (SEO), Paid Marketing, Content Development, Social Media Marketing, Graphic and Web Design, and IT allow us to understand your specific needs and requirements and effectively collaborate with your business for optimum project success. Cavite belongs to the CALABARZON region, or Region IV-A, which is the second largest contributor (14% in 2018) to the country’s total GDP. Being located in this fast-growing region enables us to expand our operations and attract more partners who want to get in on the opportunities. Cavite is easily accessible to major business hubs in the Metro Manila, just 1-2 hours’ drive away from Manila, Makati, Ortigas, and BGC. Cavite is home to over a dozen public and private colleges – providing local businesses with a steady stream of talented and skilled graduates every year. Cavite has over a dozen industrial parks and townships that attract more and more investors per year. Due to lower minimum wage rate and commercial space cost, increasing numbers of local and foreign businesses are finding this province to be a more cost-efficient location to establish and run their operations for the long-haul. The new and upcoming Central Business Districts such as Lancaster and Vermosa in Imus, Evo City in Kawit, and Maple Grove in General Trias has made many experts see Cavite as the next “Makati”. Imus is a city in Cavite, and the de jure capital of the province. It is also the religious center of the province, serving as the seat of Roman Catholic Archdiocese of Imus. Over the past recent years of improving economic climate, Imus City has attracted a number of foreign and local investors either to initialize their operations of establish a physical base in the area. Just 18 km from Metro Manila, Imus City serves as a favorable location for industrial establishments, such as the Imus Informal Industrial Estate, Anabu Hills Industrial Estate, Liwayway Mktg. Corp, EDS Manufacturing Inc., and San Miguel-Yamamura Asia Corp.